Recently Dr. Mercola, osteopathic physician and a well-known proponent of alternative medicine, published an interview that he conducted with Dr. Jerry Tennant, an ophthalmologist and a creator of the Tennant Biomodulator – a SCENAR-type device widely distributed in the USA. 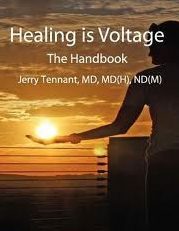 Dr. Tennant has published a book “Healing is Voltage: The Handbook”, where he offered his view on health and disease and explained the theory he put behind his device. Like most of the “holistic MDs”, before embracing energy healing Dr. Tennant went through a personal crisis. In 1995 he developed viral encephalitis (viral infection of the brain) and spent the next seven years bedridden, without hope for recovery. There were no conventional treatments that could help, and Dr. Tennant had to take matters in his own hands. He did a lot of studying of cellular biology and came to the conclusion that in order to function and recover cells have to have a sufficient VOLTAGE. “Understanding that my brain didn’t have enough voltage to work correctly, that was really what started me on the journey of trying to figure out how to get things to work again,” Dr. Tennant says. Dr. Jerry Tennant is now 77. His recovery is complete. He enjoys a healthy and energetic lifestyle, still goes to work every day, and passionately advocates energy healing to those willing to open their minds to unconventional ways of becoming and staying healthy. Now, do we agree with Dr. Tennant that “healing is voltage”? Not quite. It is not that simple, and SCENAR is much more than a “waveform that can transport electrons to the cell membranes.” And yet, both Dr. Karasev and I agree that Dr. Tennant’s view of pH as voltage makes a lot of sense and that his comprehensive explanations of complicated matters can be quite helpful in understanding of bioelectricity and the role it plays in health and disease. That’s why I suggest this article of Dr. Mercola for you to read (and, if you have time, watch the entire interview on video). Do SCENAR and COSMODIC “increase the voltage”? Certainly, especially in the intercellular space. They are excellent electron donors and definitely support and improve functioning of the four major battery systems in the human body, as described by Dr. Tennant. COSMODIC is also thought to substantially increase the content of structured water in the body – another major system that holds and delivers bioenergy (Dr. Mercola expands on this topic in another article HERE, and I also talked about it in my article two years ago: http://healthboss.org/blog/2015/11/22/4th-phase-of-water). The ability of SCENAR and COSMODIC to “increase voltage” of the living tissues is further enhanced by the use of shungite attachments due to the bioelectric qualities of shungite itself. The mechanism of action of SCENAR and COSMODIC, however, is not limited to merely increasing the voltage. High efficiency of these technologies and their ability to trigger regenerative processes cannot be explained in bioelectrical terms only, like performance of a computer cannot be attributed only to its power supply: yes, computer cannot function without electricity, but it is a software that ultimately determines its qualities. The power of SCENAR and COSMODIC is in improvement of the flow of INFORMATION in the body, in the ability to make the “body’s computer programs” work better. There is a lot still unclear in how exactly these technologies affect the body’s informational field, and at this point all we can offer you are theories. Dr. Karasev is also not very forthcoming with explanations; as I already wrote before, he thinks that the world at large is not ready for these explanations. I tend to agree. In the time when even the age-old practices of Traditional Chinese Medicine or Ayurveda are often considered quackery (and I am not even talking about homeopathy, Reiki, radionics and the like), what are the chances that, say, existence of bioplasma as the fifth state of matter in living systems and as the energo-informational matrix of the body as well as the methods of harmonizing and enhancing it will be taken seriously? I would say, pretty slim. I will leave it up to you to judge where are we in this progression as a society with regards to energy medicine, but it is clearly not the “self-evident” stage. Far from it. So we are taking baby steps – and in that Dr. Tennant’s “healing is voltage” explanation of bioelectricity and bioenergy can be very helpful indeed. We will get to the spin electricity, vacuum magnetic polarization, or increasing of anti-entropy qualities of bioplasma later, when these terms will not sound so alien and so “out there” that our mind just outright rejects them and everything associated with them. We will get there, I have no doubt. There will be time when COSMODIC and, further, ENS will not be enigmatic anymore. For now, however, let’s go with “healing is voltage” and enjoy all the benefits these wonderful technologies can bring, just as most of us enjoy our smart phones and computers without actually knowing what is going on inside their stylish techno-bodies. I first came across the Scenar through reading Dr Tennant articles and book- which I found helpful. I was very curious and somewhat scared by his view of root canals. He assumes that it is impossible to eradicate the original infection or balance our bodies energies ( I presume even with the Scenar) if you have had root canal done! For most of us that have had this procedure the challenge is daunting. My view on the root canals is somewhat different. Yes, it is almost impossible to remove all of the original infection during the procedure (unless it is done in stages), but I also believe that the body is strong and wise enough to develop a strong immune response to block the remaining infection or eradicate it completely. Of course, if the immune system is weak that may not happen – and then we have a problem. The alternative to the root canal surgery is a tooth extraction – and I believe it may be even more damaging to the body in the long run. There may be no infection, but the absence of a tooth may trigger the DDS (Dental Distress Syndrome), and I am not sure which is the lesser of two evils. I am wondering if Dr. Tennant’s biomodulator is a device that can be used in place of the Dove or Cosmodic? I have the Dove and use …intrigued and mystified. In other words is the biomodulator as good for healing a person as the Dove? Just like the DOVE scenar (or any other SCENAR device, for that matter), the Tennant Biomodulator is an adaptive electrical stimulator that uses biofeedback to communicate with the body. From that point of view, these devices serve the same purpose of increasing the body’s awareness and helping it heal itself. We, however, cannot provide you with a direct comparison of their efficiency in achieving this purpose since we have very limited experience of working with Biomodulator.